You always hear about all the different ways to implement search engine optimization or SEO into your website. However, you might not hear about negative SEO as often. And you really should. Though it doesn’t happen that often, the fact that it can at all is cause for alarm. This shady tactic involves affecting the rankings of a website other than your own in malicious ways. This is terrible because, despite your best efforts, someone could be trying to actively destroy your site. Any SEO efforts you’ve implemented could be counteracted and ruined without you even knowing it! The number of incidents increased after the roll out of Google Panda and Penguin. These algorithm updates were designed to identify and penalize spam on the web. However, since sites can be punished for using poor SEO practices, it stands to reason that blackhat folks would take advantage of this fact. Instead of building up their website, they could easily tear down another. Scary stuff for web developers and optimizers everywhere! 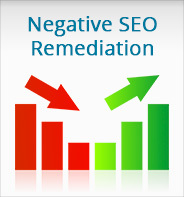 So the question is, how can you spot negative SEO? What factors signal its presence? – Load Times. If it suddenly loads slower than normal, someone might be scraping content from your site and slowing it down. – Check your backlinks. Too many poor backlinks to your site could negatively impact its SEO. Take a quick look in your site back links list to see if this is the case. – As mentioned under “Load Times,” content scraping is one of the biggest ways people tear down sites. They use software to copy all of your content then launch mirrored sites, thereby reducing the originality of your site. – An influx of bad reviews. If you suddenly notice a bunch of bad reviews for your site/company popping up on review sites, you may be a victim of unethical practices here. – Nonsense keywords. That is, when you look in Google Analytics at the search terms people used to get to your site, they should make sense for the content you provide. If you notice a bunch of keywords that are completely unrelated to your subject, you have every right to be suspicious. If you notice any of the above items going on, you may be the victim of negative SEO. Thankfully, we can help you! We can identify the cause/source of the problem and eliminate it quickly and easily, restoring your rightful search engine rankings in no time!